Finally announced, the program of the ninth extraordinary edition of Collisioni, the agri-rock festival of literature, music and enogastronomy most awaited of Italy, taking place in July in Barolo, treasure of Italian wine, in the wonderful landscape of Piedmont’s Langhe hills, UNESCO World Heritage, a natural stage to host, in its squares. Music, speeches, encounters with literature Nobel prize, music stars, international acclaimed actors, experts of wine&food. All of this, in an informal atmosphere of dialogue, crossover and “collision” of arts, with protagonists, writers, movie directors, journalists, but also musicians and actors, that in Barolo will be storytellers and speakers with the public. On the stage on this new edition of Collisioni Festival, SATURDAY 15 and SUNDAY 16 JULY, many international guests: Chinese Nobel Prize Gao Xingjian author of masterpieces as Soul Mountain, President of Italian Senato Pietro Grasso, speaking about his career through anti-mafia protagonists. Among the guests, movie legend Matt Dillon, protagonist of milestones of Cinema: Rumble Fish and The Outsiders. Many International guests: Dave Eggers, the American author of A Heartbreaking Work of Staggering Genius, dialoguing with wife Vendela Vida; American author Jeffrey Eugenides, of The virgin suicides e Middlesex, winner of Pulitzer Prize 2003; Joyce Carol Oats, one of the greatest American writers, many times finalist of Pulitzer Price, Jonathan Coe, british author of The Winshaw Legacy as well as many Italian artists and writers. A decade of Collisioni Festival is approaching, but the party starts this year already! Concerts of international artists: Robbie Williams July 17 and Placebo 16 luglio and an extra-appointment July 27 with The Offspring, but also great names of Italian music: Renato Zero on July 18, e the Silvestri/Consoli/Gazzè concert, with a double date Friday 14 e Saturday 15 for a concert that will be an unicum in all Italy. 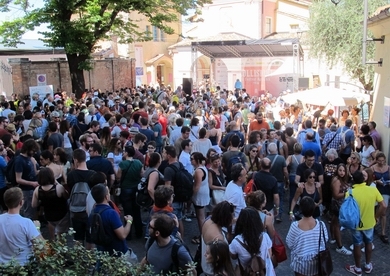 With this edition, Collisioni confirms itself as the more important Piedmont Festival, considered by most of the press and critic as the best Italian festival for its innovative format and the ability of speaking to a heterogeneous audience, offering a varied mix of music, literature, cinema, wine education, gourmet gastronomy but also family entertainment. The Festival takes place in Barolo, a prestigious location of international tourism, known worldwide for its enogastronomic excellences and epicenter of UNESCO Piedmont patrimoine, the only vinicultural area being recognized as so. A village transformed for a weekend in a great non-stop stage where every square and road of the village comes alive with meetings with renowned names of international literature, music, journalism and show business, artistic installations, music performances, big concerts with the most important start of the international scenario. 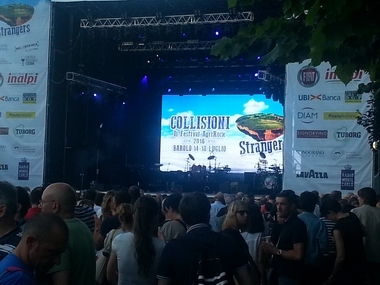 Collisioni was honoured to host in 2012 Bob Dylan concert as only Italian date for the 50 years of Blowing in the Wind. 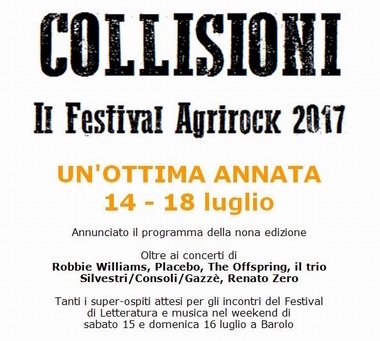 Among the greatest artists playing on Collisioni stage, Jamiroquai, Neil Young, Deep Purple, Sting, Mark Knopfler, Passenger, Paolo Nutini, Elton John, Patti Smith. Indeed, to truly understand the soul of agrirock festival Collisioni and to understand the unique atmosphere that will be breathed in Barolo in those dates, the richness and quality of the cultural and music program is not enough. The other great protagonist of the kermesse, in the village that is now the symbol of Italian enological culture, will be wine & food from all over Italy, that the audience will be able to appreciate on the new Wine&Food Stage in Barolo Castle’s courtyard and the many regional stands around the village, dedicated to the greatest excellence of Italian enogastronomy, that will make walking in Barolo during Collisioni a continuous discover through new tastes and millennial traditions.